Properties that were predicted by ACD/Labs showed 2 #H bond acceptors, 7 Freely rotating bonds, index of refraction at 1.597 with a surface tension of 41.5960006713867 dyne/cm, a flash point of 287.085 °C and a boiling point of 551.083 °C at 760 mmHg. 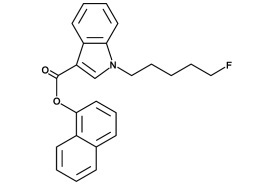 NM-2201 is a novel synthetic cannabinoid. Little to no research data available on this chemical makes it impossible to describe it’s properties in detail. However, it is an analogue of another synthetic cannabinoid AM-2201, meaning it might share some similarities. Properties that were predicted by ChemAxon included a topology analysis, which showed an atom count of 49, bond count of 52, cyclomatic number of 4, chain atom count of 8, chain bond count of 9, asymmetric atom count of 0, and rotatable bond count of 7. Under geometry, the information provided showed deriding energy of 102.38 kcal/mol with a volume of 332.98 Å3, a minimal projection area of 53.39 Å2 and maximum at 118.37 Å2.